Image courtesy of Rebecca Sugar. The first and very obvious difference between the pilot and the series proper is the animation style. It runs a gamut between older anime and 80s American cartoon shows and very raditude-y (i.e. Let’s do this because it looks badass!). The aesthetic is very 80s, like Amethyst’s slouchy sweater, FANNY PACK, and hair; Garnet’s super pointy shoulder pads, and Pearl’s one star earring and dapper little waistcoat. Garnet looks much more like her voice actress, Estelle, in this version. Pearl is much more androgynous and lanky, versus the pointer Bird Mom we all know. Amethyst is still round, but she’s much more childlike in this version, with wider eyes and longer body proportions. 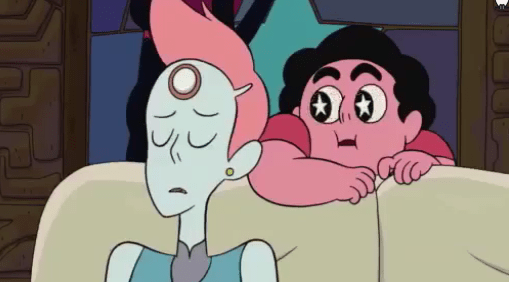 There’s also a lot of little things like the Crystal gems having stars on their costumes, but much less obvious. 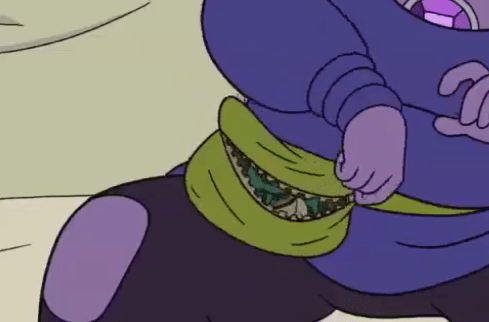 Garnet’s is on her belt. 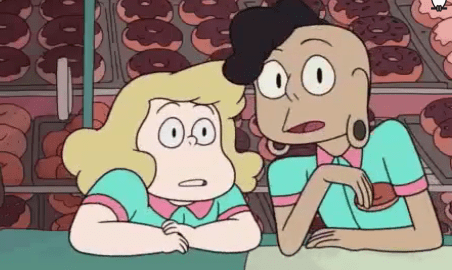 Pearl’s is her earring (perhaps a reference to The Girl with the Pearl Earring?). Amethyst’s is in her hair. Rebecca Sugar has stated in interviews that she took inspiration from Lumpy Space Princess from Adventure Time for Amethyst and it is very clear in this version. 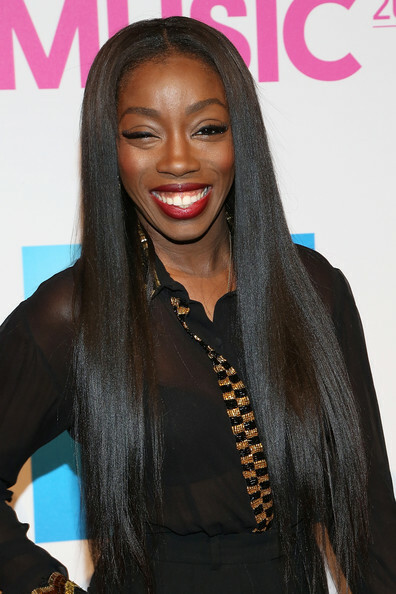 Garnet also looks WAY more like Estelle in the Pilot than she does in the show proper. Here’s a comparison! One possible reason for the stylization of the Pilot is that it was directed by Cartoon Network favorite, Genndy Tartakovsky, known for directing very stylized shows such as Dexter’s Laboratory and Samurai Jack. As for the change in style after the Pilot (which was leaked) was that Rebecca wanted them changed. (Seen here in Q&A from showrunner Ian Jones-Quinley’s Tumblr) It was not because of the Network putting pressure on the Crew, but Rebecca redesigned the characters and apparently Cartoon Network has been very supportive or Rebecca’s creative choices. As with the majority of pilots, the Pilot episode for Steven Universe was a test. It is good to note that even though Steven’s voice sounds very different, I could not find any information refuting Zach Callison’s portrayal of Steven. Sometimes it takes voice actors, especially younger voice actors to really “get into” a role, so it’s very possible Callison hadn’t really found Steven’s voice yet when the Pilot came about. All of the other roles are played by the actors that would reprise them in the series proper: Estelle as Garnet, Deedee Magno as Pearl, Michaela Dietz as Amethyst, Matthew Moy as Lars, and Kate Micucci as Sadie. The plot of the episode follows Steven after he gets handed a “time thingy” (it is never officially named in the episode), an artifact the Gems had been protecting for one thousand years. This is very similar to the one seen in Episode 22: Steven and the Stevens. (In which Steven uses a time thingy to form a band with three past versions of himself.) Steven uses it to burn Lars at the Big Donut after Lars is mean to Steven (glad to see that hasn’t changed) and “comebacks” are now the time thingy’s sole purpose. Steven uses the time thingy to go back in time to save the Gems and Beach City from being attacked by a gemmed skull thingy (also not named in the episode) that’s powers are mysterious and hard to discern. Though the episode isn’t as fully developed as the series proper episodes, there is still a lot of good crunchy bits as far as Gem lore and character development. What we learn from the episode is that Steven is half-human, half-gem and though he has powers, they haven’t shown themselves. Garnet, Amethyst, and Pearl at least go to the temple, if not live there. It’s not super clear if Steven lives there. Steven plays the ukulele (which kept much of its look into the show proper). Steven is a goofball, if not the party’s Bard (sorry, that’s the D&D nerd in me talking, from this exchange: Pearl: You want to sing that during battle?/Steven: Yeah! /P: Why?/S: Because I’ll look really cool!). Steven makes up a song that would eventually become the theme song in the show proper. The Big Donut exists, but is extraordinarily close to the temple. 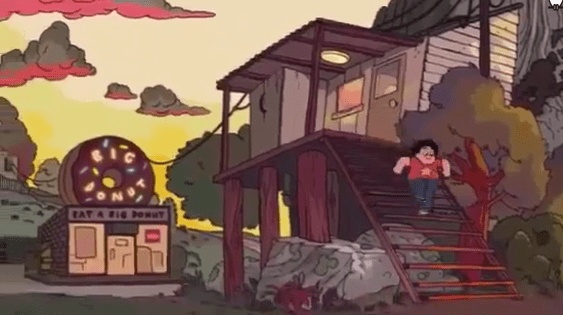 It can be seen within walking distance of the temple, but in the show proper, the temple is on the other side of the beach from Beach City to where only one mailman has ever known Steven lived there. We learn that the Gems personalities are fairly intact: Garnet being mysterious, but supportive of Steven, telling the others not to make fun of him. (Though she calls him a “buttface” which causes him to be able to save them from the skull thingy.) Pearl is cautious, but protective of Steven, trying to make him not look silly by calling him a “clown” which causes Steven to ultimately go back in time, erasing the whole experience. Amethyst is kind of a trouble-maker, but I think she just wants to be friends with Steven, which is why she secretly gives Steven the time thingy. Lars and Sadie are also very close to their show proper personalities. 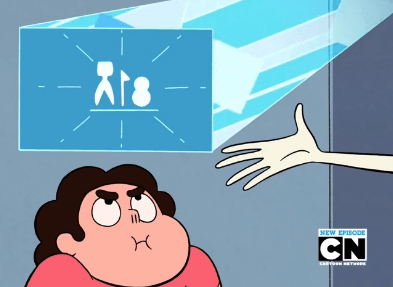 Sadie is caring and a little protective of Steven, if not protective of others FROM Lars. Lars is much more offensive in this version, calling the Gems the “Crystal Femmes”, accusing them of being witches, and most rancorously, saying that the Gems are “hot girls” and Steven can’t be one because he’s not a hot girl. When Steven uses the time thingy to say his snappy comeback at him, Lars gets extremely upset by being burned and is very defensive and mean, more so than he is in the show proper. I think Lars is much more toned down in the show proper and with more character development is made to almost be a sympathetic character versus a full-on antagonist to Steven, who insists he and Lars are BFFs. Steven’s personality is also very similar to show Steven, though he’s a bit less sure of himself, but really, REALLY wants to help the Gems. Lars’s hair changed colors in the show proper, but he still has his characteristic plugs and stretched earlobes. Sadie is extremely similar to her show proper look. There are rainbow gems all around the warp pad. The skull Amethyst brings back is very reminiscent of Dia de los Muertos sugar skulls. Pearl says they’ve been protecting the time thingy for 1000 years! Where the heck is Greg?! Overall, the pilot episode gave us a good platform to see into the world of Steven Universe and to see if we’d like it. The answer is obviously, “Yes, duh.” There are definitely some great little details in this pilot and though it is only about seven and a half minutes long, tells a pretty good story. All screencaps were captured by myself.